Langila (New Britain, Papua New Guinea): Volcanic Ash Advisory Center Darwin (VAAC) issued the following report: VA TO FL080 CONTINUES TO MOV NW. Dukono (Halmahera): Volcanic Ash Advisory Center Darwin (VAAC) issued the following report: CONTINUOUS VA EMISSIONS TO FL100 EXT E.
Hudson (Southern Chile and Argentina): Seismic activity under the volcano has recently shown a mild increase, triggering Chile's SERNAGEOMIN to raise the volcanic alert level to "yellow". The source of the quakes seems to be the same or similar to the 2011 eruption. 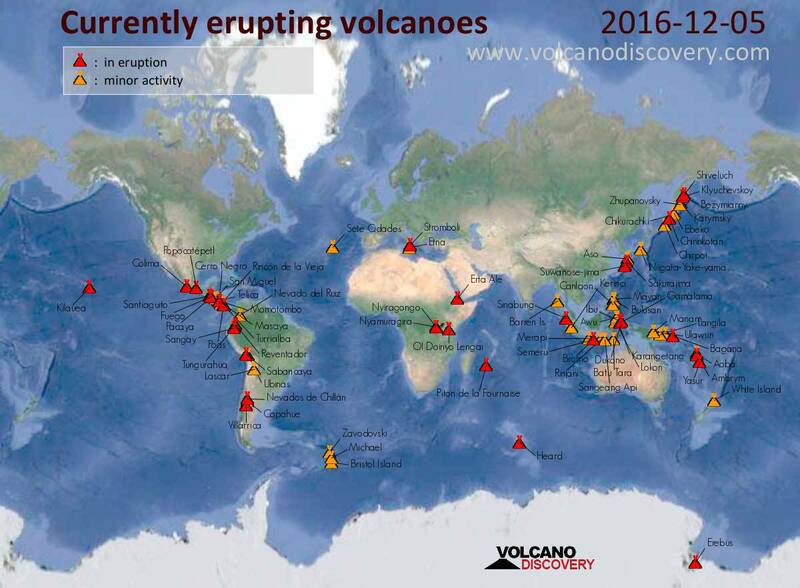 No other significant signs of volcanic unrest (such as increased degassing, surface temperature etc) have been detected suggesting that an eruption (if at all) is not likely to come very soon. ONEMI (Chilean Civil Protection) also issued a warning for 3 municipalities (Aysén, as well as Río Ibáñez and Chile Chico to the east and SE) which are potentially at risk in case of new eruptive activity. The principal hazards are ash falls and mud flows (lahars), the latter are however only likely in case of a major eruption (such as the one in 1991) that could generate a glacial flood into rivers draining the summit caldera.